I want to store some rainwater off the roof. Looking at water storage tanks and the prices I found the DOS brand has a line of tanks called 'Greenery'. Any comments on these? DOS is a reputable brand and these tanks are about as inexpensive as they come. About 3,100 baht for a 1000 liter tank guaranteed for 15 years. (I don't take much notice of the guarantee except as an indicator. I am sure you could never collect unless maybe really faulty right at the beginning) At the shop the salesperson pushed the side and it yielded and said 'not good' and showed us a Wave brand (or something) at about 1000 baht more in price. The side of this one yielded also when pushed. Hot sunny day no shade. Frankly I couldn't see any or much difference except the colour. My Thai wife asked why this one is better and is it that the commission on the sale of the second one was higher? The salesperson giggled a bit and said yes. Any comments on this or can someone recommend a better option for a low cost tank? While you are here, any ideas about a cheap 3" water shutoff valve to make up a diverter to let the roof clean before collecting water to keep? Thanks in advance. I have a DOS 1000 ltr. tank, its about 3 yr.s old now never had a problem yet. They are about the best in their price range among many I looked at and were not much more expensive than those junk blue tanks they sell. I also like the tank lid, screw on type but has a good seal. I will recommend you put a drip irrigation mesh screen type filter on your fill line and your tank will stay clean. Lots of good ways to make a flush diverter. I don't know about those brands but the better tanks are made with more than one layer. You should take a flashlight and hold it against the outside of the tank. If you can see the light through the wall of the tank, keep looking, because any light showing through will allow algae to grow inside the tank. 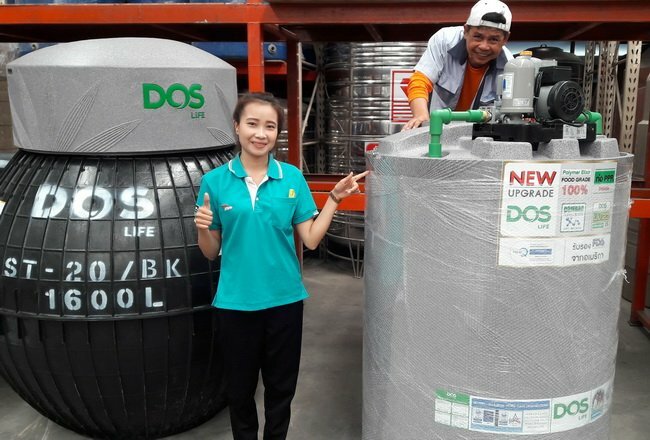 The DOS Greenery line of water storage tanks sold at Homepro | ThaiWatsadu | Global House in Thailand is a budget bottom of the line single wall water tank. For storing rain water for your garden in Isaan this might be a water tank worth consideration. I just ordered a DOS Natura Water Pac Series Polymer Elixir 1000 liter water tank with Hitachi WM-P300GX on top and under cover, to be delivered to my Buriram village home. The green PPR pipe is inside the tank. It is a plug and play concept water tank | constant pressure water pump as one unit sealed from the rain. The Hitachi water pump is installed at the DOS tank factory on top of the water tank and then the lid is attached. Perfect for our new guest house. I prefer the granite color water tanks to green or blue single wall tanks if the water is used inside a home for showers or cooking. Grundfos CMB 5-46 was also offered as the water pump option. 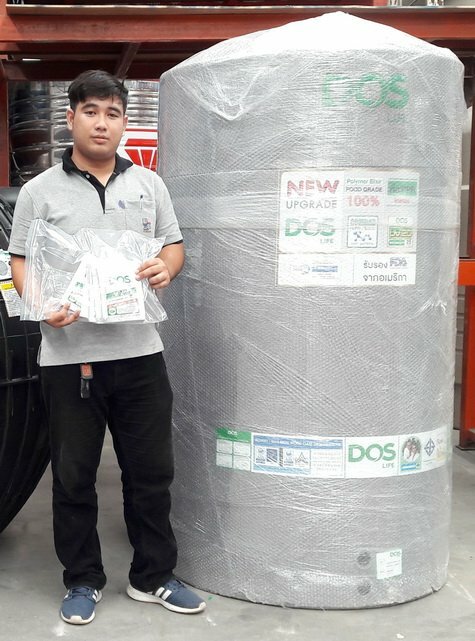 Photos of the new DOS Water Pac Series that will be installed on Tuesday at my Buriram village house. The Hitachi Constant pressure Pump is installed at the DOS Thailand factory on top of the rain proof water tank. The grounded electric cable can be on either left or right side of the water inlet and water outlet. The green PPR pipe is installed inside the Polymer Elixir water tank. 1000 litre tank and pump how much please? List retail Prices are posted in the DOS water tank brochure for series. Some stores I walked into were not familiar with discount. One store was familiar with the concept of cash and discount. The brand of water pump and model of the water pump impacted the selling price of the DOS pump. I selected a less expensive Hitachi water pump and not the Grundfos water pump for this small Buriram Village House. Any DOS dealer in Thailand could sell this pump | tank combo if they were motivated. I will post photos of it installed on Thursday or Friday. Works perfect for this home with Stiebel Eltron Shower water heaters.